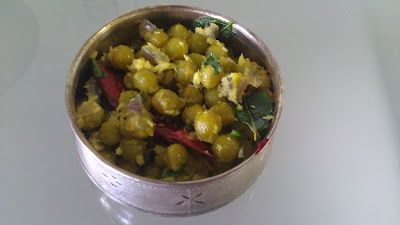 Soak the green peas for overnight and cook with small amount of salt. Grind both in to coarse paste with little water. Heat oil in a pan,splutter all seasoning ingredients one-by-one. Add onion and fry till get's soft. Then add the grounded coconut and mix well. Finally add some cilantro on top ,mix well and serve. Note:Can do same method for all type Sundal.Splutter some chopped green chillies for extra spiciness. Very healthy and simple recipe.. thanks for sharing dear !! I frequently make sundals with various legumes for a filling snack...never added garlic though..looks great.